On Monday we left Moab and headed for Hurricane. Hurricane (pronounced HUR-ken) is a small town about 20 miles east of Zion National Park. This story isn’t about the town or Zion though, it’s about how a little inattentiveness can really mess things up. Hurricane is about a five to six hour drive from Moab, so we hustled to pack up the RV and get on the road. Once again, we encountered high winds as we went west, and they didn’t let up when we turned south. As we drove south, distant clouds grew thick and brown and we realized we were seeing a wildfire. The thick smoke billowed over the mountains, and we could see a fringe of red flame on the crest of one mountain. I googled Utah and found there were several active fires going. The vicious winds were no help to the firefighters. We pulled into WIllow Wind RV park, tired from the long trip. There are a million things to do when you set up; you have to connect all the utilities, water, sewer and electric, level the coach, set the jacks, and the last thing you do is deploy the slide rooms. The slides are the walls that expand the width of the coach and turn it into a cozy living space. One by one, Ben set out the slides, the last one the longer kitchen slide. I was outside watching a tree to make sure the slide didn’t hit it. As it started to move, I heard a sickening crunch, and Ben yelled. I ran in, and the end of the kitchen slide looked like it had hit a fault line. Have you ever totally forgotten some event, and then in a blinding flash you see the whole thing in front of your eyes? Well that happened to me, While we were parked in Moab, I’d stuck a cutting board next to the slide because it was in the way. I’d totally forgotten about it until I heard that crunch and I just knew it had gotten in there somehow. Ben got his flashlight, we pulled out the drawers, and there it was. He fished it out and thank god the slide still worked or it would have been the end of our trip right there., Sadly though, this will be an expensive fix. 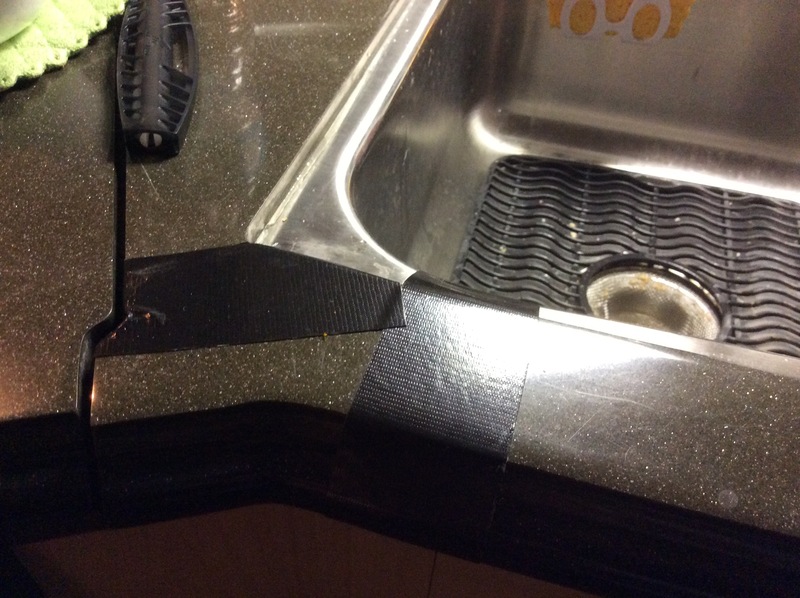 The pressure of the cutting board against the slide structure sprung the end cabinet out of line and broke the corian counter in three places. We can’t open the slide but we’re still mobile. The kitchen, however, looks like a scene from a Stallone disaster movie. In case you’re interested, the cutting board is unharmed. I’ll have to write a kind letter to the Gorilla Tape people. 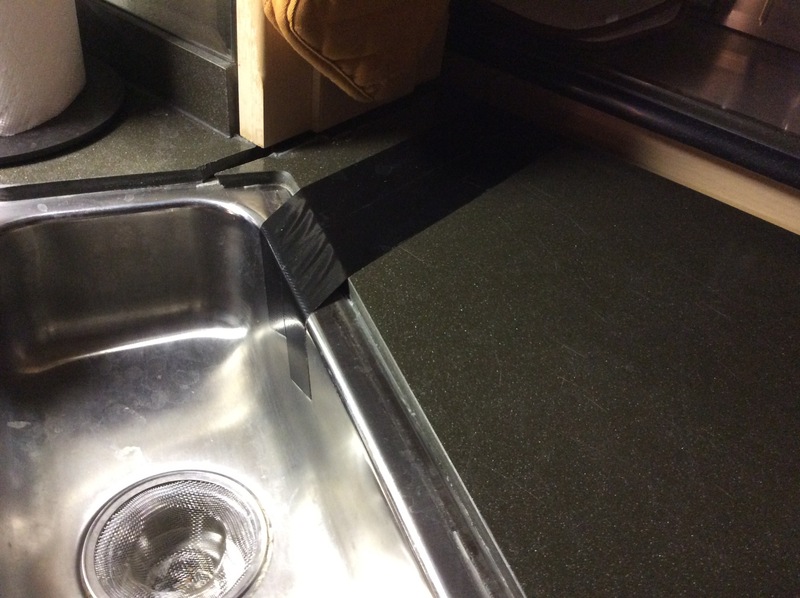 Ben taped the shattered pieces of the counter back together, and we’ll be able to make do until we can get the RV repaired, This was the same slide I mentioned in an earlier post that nearly broke due to a mechanic dropping a plastic part into the slide mechanism. I think the thing is cursed. Ben, God love him was very kind about the whole thing, but I imagine it’s a hard thing to be level headed with someone who just destroyed a room in your house–wedded wife or not. This was three days ago and I still get a sick feeling when I think about it, but I was morose right after it happened. I’m not a crier, but came pretty close to it that night. I came up with about every version of #I’msosorryIdon’tdeservetoliveonthisplanet. When we went to bed, Ben leaned over and said “I know you feel bad, but I’m OK. I think the Lord reached down and put his hand on my shoulder…” “And restrained you from strangling me?” I asked. We didn’t have specific plans for our route back to Ohio, but now we are likely going to go home via Red Bay Alabama, where the Tiffin motor home factory is. Red Bay is a little like Mecca for Tiffin owners. There is a factory campground where the faithful can wait their turn for service. We are going to give it a shot on the way home. I have no idea what might be in Red Bay, but you can be sure I’ll write about it. You can see where the counter and wall seperated. 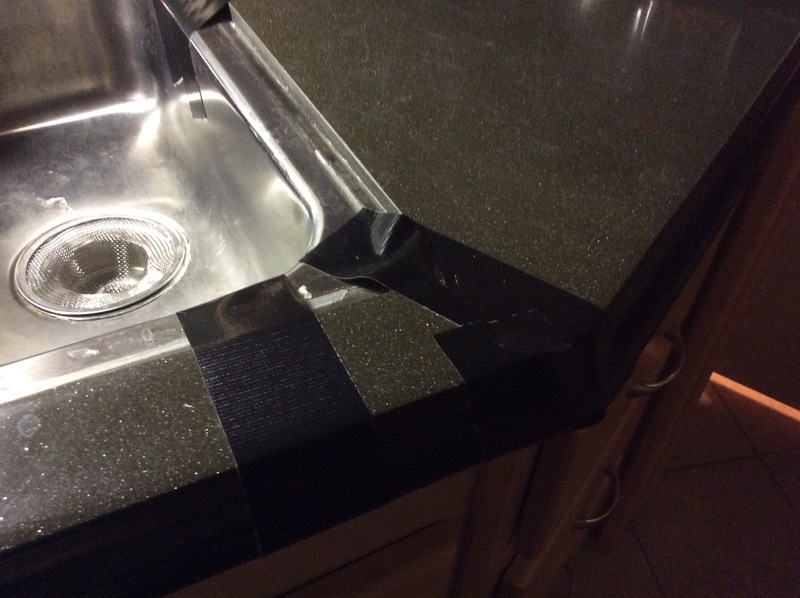 The tape is holding the pieces of counter together. For now. I’m glad my home doesn’t move.